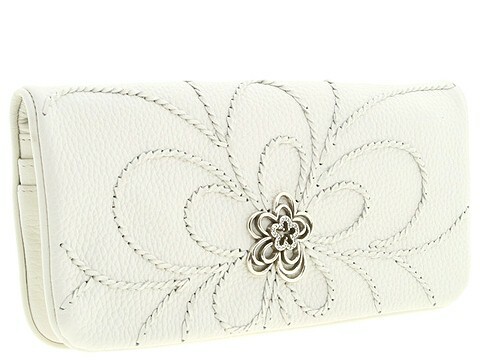 Accent your look with the 'Infinity Flower Oragnizer Clutch' from Brighton (link ). Made of glossy embossed leather. Holds your credit cards, currency, lipstick and a slim cell phone. Dimensions: 10 wide x 1 deep x 5 high. Magnetic snap closure with floral hardware embellishment. Interior features credit card slots, slip pockets and two zip compartments. Free shipping in the USA.